Walking the Fine Line: Is anyone there? Finding Balance in an Unbalanced Life. Hello? Does anyone ever check this dead blog anymore? I'm so sorry for my absence. Please just know that we have been enjoying life to the fullest! Elaina continues to thrive and defy medical expectation. She loves pre-school. She loves being outside and especially loves to swing. She is still in love with her Disney princesses. Cinderella, Belle, Ariel, she loves them all. She also finds great joy in Nemo, Monsters, Inc. and Cars. What can I say, she's addicted to all things Disney. If you really want to make her happy, give her a sippy cup of ice water and play bouncy (or tickle) with her! She is such a happy sweet wonderful girl! Ben just turned 10 and is growing up into an amazing young man. He is the best big brother that any little girl could ever ask for. He loves being a Cub Scout (he just earned his Bear badge), he loves riding his bike and swimming. He loves building his lego's and is obsessed with all things Mario (Nintendo). Throw in some Angry Birds and reading some Diary of a Wimpy Kid and that makes his life complete. Now that I've done a brief catch up, I just wanted to say that I'm going to make a private blog. If you'd like to keep up with us, please comment with your email address so that I can send you an invite. I just worry about trolls and others that take advantage of special needs families and I want to be able to post pictures, etc. without worry. :) Thanks for your understanding and I hope you'll want to keep up with us! Yes!! I still check your cutie bug's blog! You are so wonderful, Hollie! Someone loves her big brother! "Trust in the LORD with all thine heart; and lean not unto thine own understanding. In all thy ways acknowledge Him, and He shall direct thy paths"
Steve - adult CHD survivor! I am the lucky mother of two extra-ordinary children. My oldest is Ben. He is 10 years old and has more energy than even he knows what to do with. He is in 4th grade and is growing faster than I can keep up with him. My baby is Elaina. She was born in January of 2008. Elaina was born with some serious health problems. She has a Complex Congenital Heart Defect that includes: Pulmonary Atresia with an intact Ventricular Septum, right aortic arch, a leaky tri-cuspid valve and a large sinusoidal connection between her right ventricle and left coronary artery. 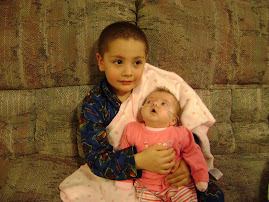 She also has a chromosomal disorder called DiGeorge Syndrome or 22q11 deletion. 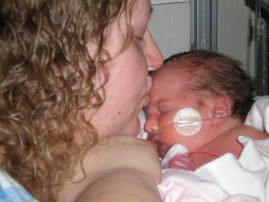 In plain English, she was born with a rare but serious heart defect, as well as some other challenges. She had a bi-directional Glenn done in June of 2008. 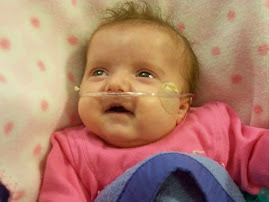 She is fed by g-tube, and continues to grow and amaze the doctors with her strength. She spent 18 months inpatient at South Davis Community Hospital after her Glenn procedure. She finally came home in April of 2010 and is thriving! She's in pre-school and loving life! Oh the adventures we have!!!!! Please click "JOIN" to sign the map. We love knowing where the love and prayers are coming from! I "borrowed" this poem off of another blog. I'm not sure who the author is, but it truly touched my heart. It's a beautiful day up in heaven. Jesus is rounding up his tiniest angels, to go live on earth, and be born. One of the sweetest angels says to Jesus "I don't want to leave, I like it here, and I will miss you". He reassures the scared little angel that everything will be okay, and that she is just going for a visit. She is still not swayed on this idea. So Jesus kneels down, and says, "How about if you leave half of your heart here with me and take the other half with you, will that be okay?" The angel smiles and says, "I guess that will work". But the little angel is still a little scared. She asks,"Will I be okay with only half of my heart?" Jesus replies,"Of course you will, I have other angels there that will help out, and you will be fine." Then Jesus gives the angel more details about his plan. He says "When you are born, your mommy will be scared, so you have to be strong, and when you feel weak just remember that I have the other half of your heart. Enjoy your time with your family, play and laugh everyday. And when its time to come back to heaven, I will make your heart whole again. Always remember that you are not broken, just torn between two loves."